Many of the 1.600 code.talks visitors shared the interest in networking and learning about the latest industry news when they attended the latest event on October 18th/19th in Hamburg. The program included several exciting panel discussions and insightful keynotes on diverse topics, ranging from IT Management to Big Data, Architecture, Security and UX/UI. With ABOUT YOU being the host of the conference, there were naturally many ABOUT YOU TECH employees involved. 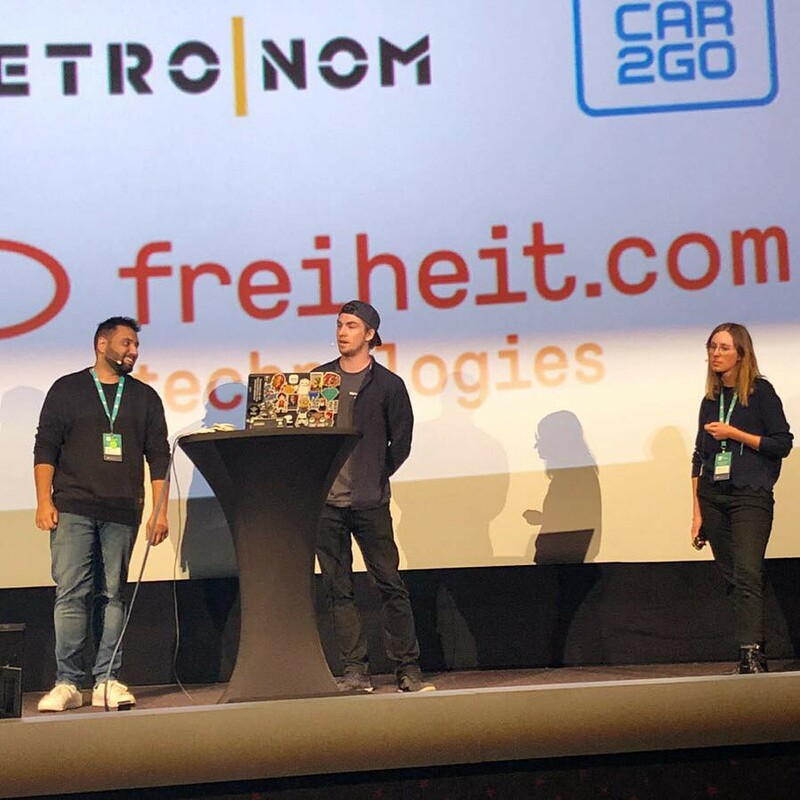 One of the highlights was the presentation of Jana Pölzl (Director Marketing & Sales ABOUT YOU CLOUD), Martin Westphal (Tech Evangelist & Tech Events) and Harminder Virk (Senior Product Engineer), who shared their thoughts on why an API based, headless E-Commerce approach makes sense for E-Commerce businesses and can actually also be a lot of fun for Developers. Jana started out with sharing some insights why we consider ourselves as a highly tech- focused company at ABOUT YOU. One third of our employees are developers — with this strong development power, innovations have a short time to market. All of our developers work in small circles within units. This makes working very efficient and also allows employees to take on new learning opportunities by moving from circle to circle. This setup enables us to develop a stable and resistant environment with a massively decreased time to market for new features. Our success story (up to becoming a unicorn 🦄 this year) is impressive, sure. But behind every success, there is always a lot of hard work and learnings involved: Two key moments in our (short) company history made us rethink our entire setup and infrastructure. The first “Big Moment” dates back to Christmas 2015, when a surprisingly successful Social Media campaign brought our systems to its limits. Back then, we were just not ready to handle the unexpected traffic that “Crazy Christmas” blessed us with. After this painful experience — many employees were called into office while sitting around their Christmas trees to help out — it was clear that we urgently needed to fix the issues. Consequently, we started to rethink our entire infrastructure. Martin explained that the foundation for the new setup was the decision to push the separation of our systems like BACKBONE, the different shops and the concerns of handling each of these systems . We rebuild our entire backend and developed our own system — known as BACKBONE — fully API based. It soon turned out that working with headless systems actually offers many advantages for developers: Frontend specialists can work in their preferred coding language and are generally more flexible since they are independent from whatever is happening in the Backend. Additionally, we no longer have to put aside several hours for maintenance efforts and can instead use the time to focus on new features and innovation. Our second “Big Moment” and test for the new setup was Black Friday 2016. Despite some doubts in the server capacity, we survived the day — but also realized that the current solution was not ideal, especially in regards to the objective to further grow our business. The logical consequence was to take the infrastructure to the Cloud in order to scale automatically and handle traffic peaks with ease. Today, our infrastructure is fully headless and hosted in the cloud. During the development of our own infrastructure, it became obvious that creating a comprehensive documentation is just as important. With multiple teams working on it at the same time, the main challenge was to ensure consistency. Harminder Virk developed a solution to streamline the different content sources and easily bundle them in one overarching documentation by providing the teams with a “Blueprint”, which clearly defines the structure of the document. At the same time, teams were trained in working with markdown. The outcome is a very user-friendly document, which includes a User manual and FAQ Section for non-developers as well as comprehensive Developer guides and API documentation. Our learnings led us to developing our own systems that we use on a daily basis. This is the foundation for further growing our business. Since we are convinced that our state-of-the-art solution can also be highly beneficial for other companies, we are already taking our own infrastructure to the market. We strongly believe that we built a reliable and powerful tool with the ABOUT YOU CLOUD, which can support any e-commerce player with serious growth ambitions to take their business to the next level.